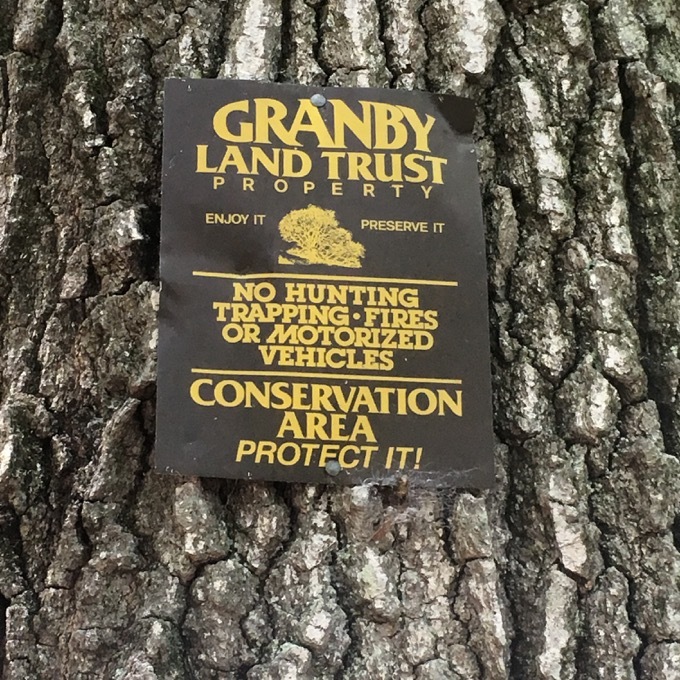 I have hiked many, many wonderful miles within Granby Land Trust properties. 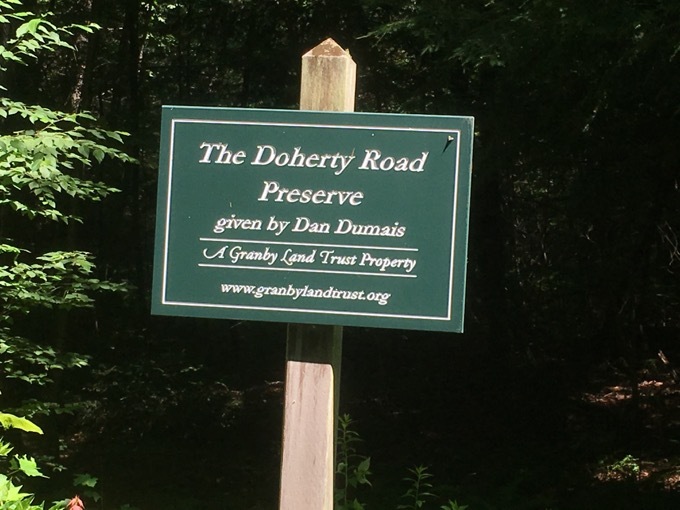 It holds a special place in my heart because it was at a GLT property (The Godard Preserve) where a young Damian got over some of his phobias. 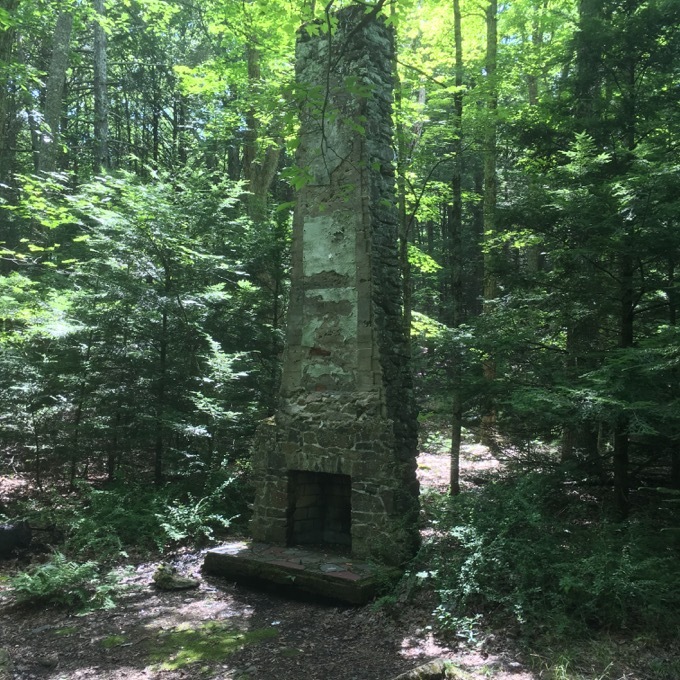 As I wrap up “completing” everything in the pastoral northern Connecticut town, I poked around several of the lesser-known GLT properties. Come… join me… won’t you? There’s nothing here… yet. But man, does it look intriguing. The woods from the sign along the one-way Doherty Road, which connects Silver Street to Granville Road, look dark and foreboding. I like dark and foreboding. My GLT contact said that there’s a “very short trail leading to the stream,” but I didn’t see it. 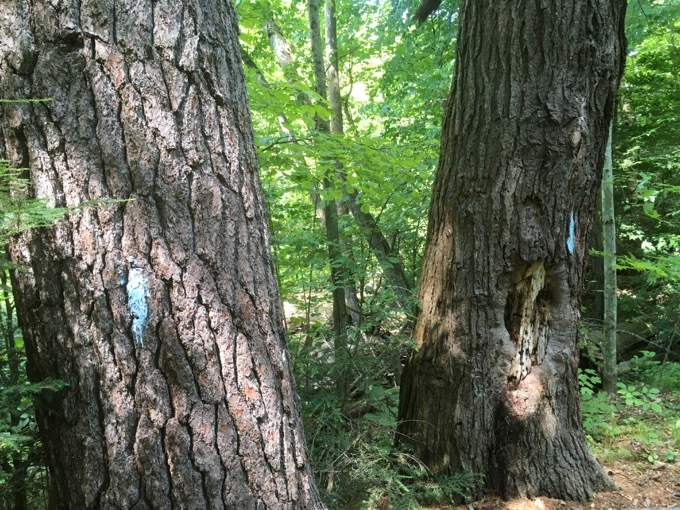 As with many GLT properties of any size, there may be a trail system forthcoming. Who knows. All I know is I took a picture of the sign so I wrote 50 words about it. More of the same. 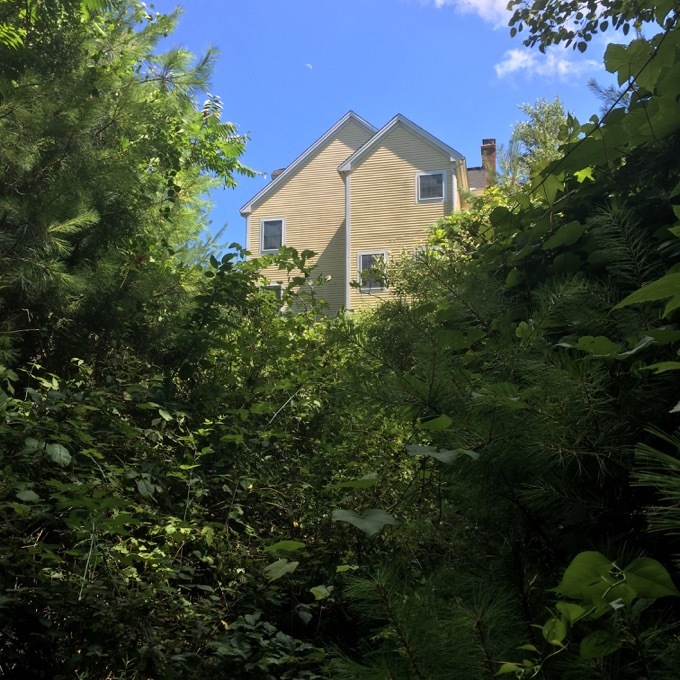 This property is along Simsbury Road near Holcomb Farm and Day Street. 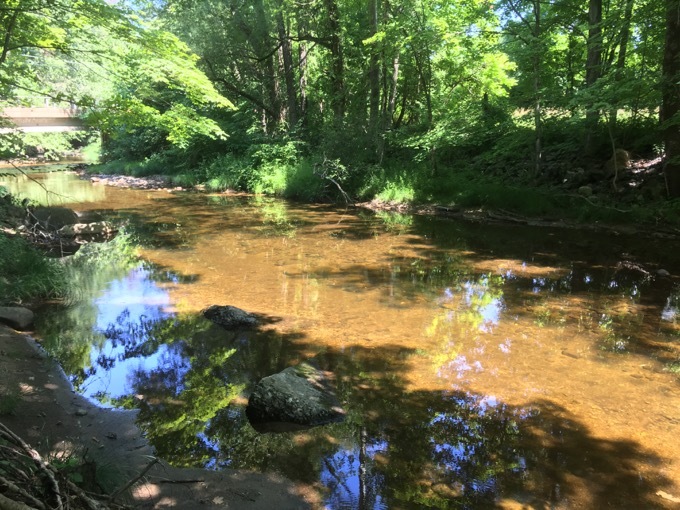 Holcomb Farm has a vast trail network that connects to McLean Game Refuge, other GLT properties, and even Enders Falls if you are intrepid. 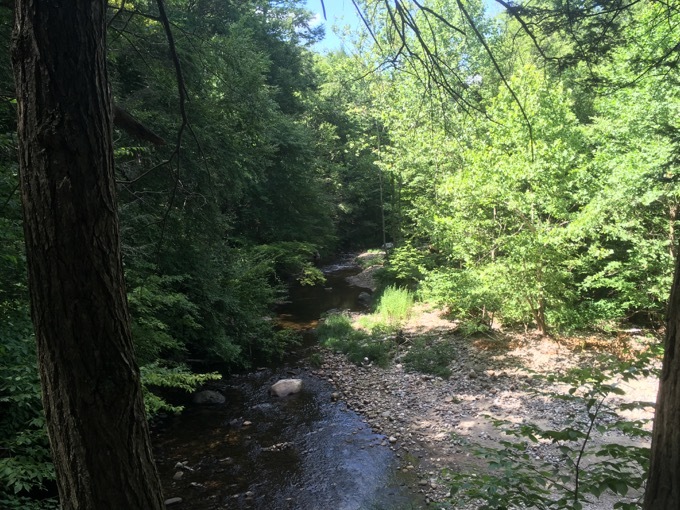 But the GLT’s Holcomb Hill Preserve features a 15-second walk down to the West Branch of Salmon Brook. The property is more than this, and serves a more important function than this, but this is all I’ve got. Just a hop, skip, and jump south of Holcomb Hill is Nuckols, with an entrance also on Simsbury Road. 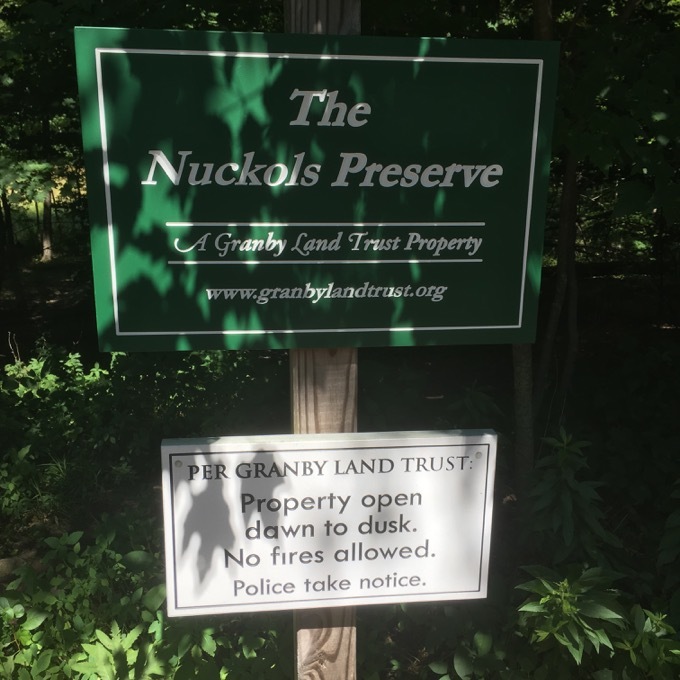 I was told by my GLT man, “the Nuckols Family Preserve has a path to the water but it is very short.” That’s okay, GLT man, I’m a curious lot. So I parked in the one-car turnout and walked down the “very short” path to the water. Okay, then. Heading back to the car… hey, there’s a trail that continues down the stream. It’s a bit faint, but it’s definitely there. Let’s check it out. 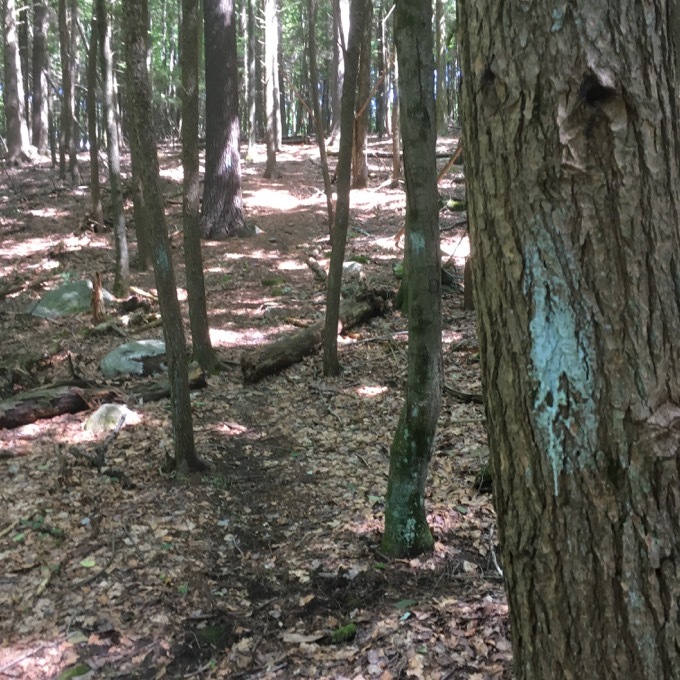 In short order, the trail became blazed with elongated blue streaks on trees. Quite a few of them, actually. And while the trail was still a bit faint, it wasn’t too hard to follow. So follow it I did… across a little floodplain and onward to another stream. I thought that would be the end for a moment, but then I saw the same blue blazes across the stream and up the steep embankment on the other side. So I followed the blazes. Up the hill. Up, up, up the hill… something was “off” about the blazing though. Clearly this was amateur work, but hey, who knows where it would lead. This is exciting stuff. 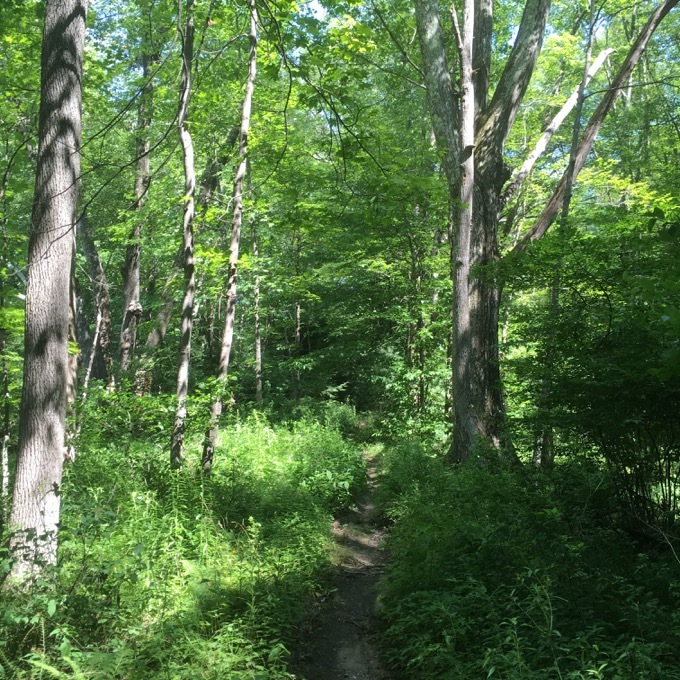 Near the top of the hill, other trails intersected and went off into the woods. I stuck to the blue for the time being and found myself heading to someone’s backyard. Joke’s on me… I thought that this was a private trail, made by the homeowner’s kids or something. 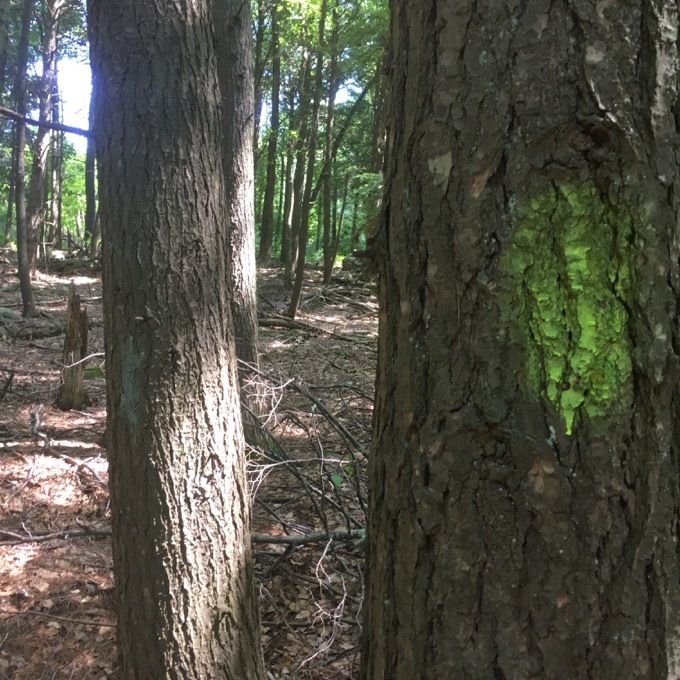 As I returned back down the hill, I noticed that the trail was blazed yellow. The same trail. Clearly amateur hour here. And sort of weird. When I got to the intersection again, I followed the trail north for a few minutes. The trail petered out and I went back to the “main” trail I took up the hill. What the heck, I continued south for a bit. And here’s the crazy thing: had I continued north, I’d have found my way to McLean. (McLean is everywhere). And had I continued south, I’d have ascended the awesome Western Barndoor Hill GLT property. That’s another of the GLT hikes that I have fond memories of with my sons. I want to thank Dave Reik for his maps and thoroughness, which I never have the foresight to check BEFORE I head out. But for me, and perhaps 3 of you, this is just great, great stuff. Here’s his GPS’d map of the area, and his write up of his experience in the same parcels. 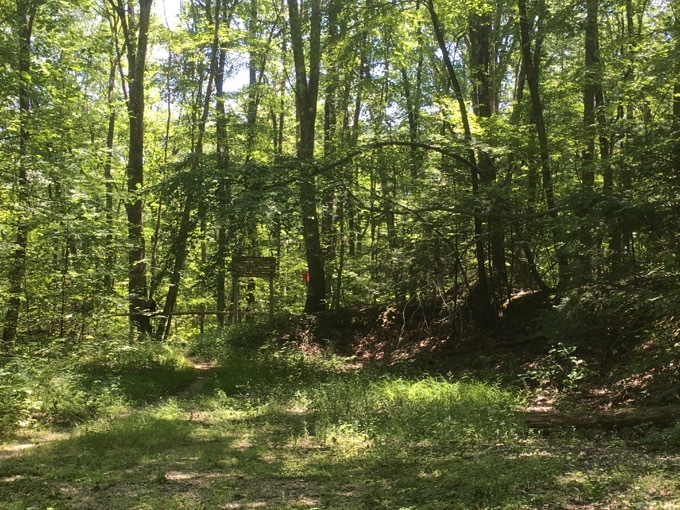 Suffice it to say that Nuckols offers far, far more than “a very short trail to the stream.” If you are adventurous, you can wend your way to some really cool places from this humble trailhead. 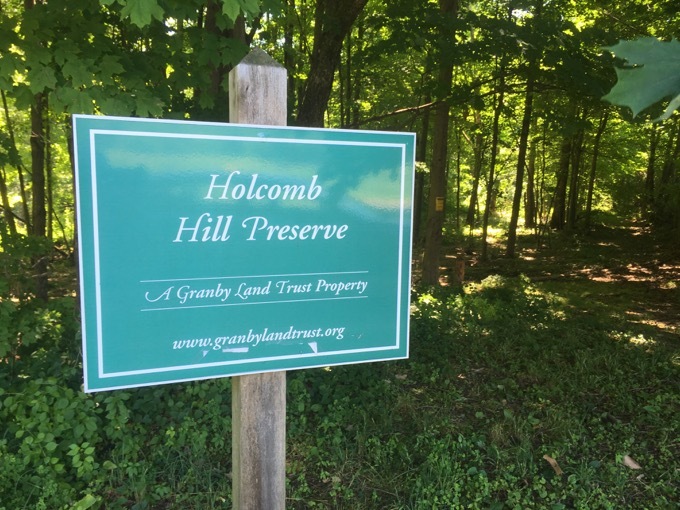 With regard to the Broad Hill Corridor in West Granby, there are trails on the Holcomb Farm Property, in McLean Game Refuge and you can access the old Broad Hill Road Trail by parking at the end of Broad Hill Road by entering off of Simsbury Road and proceeding to small parking area at end of road. 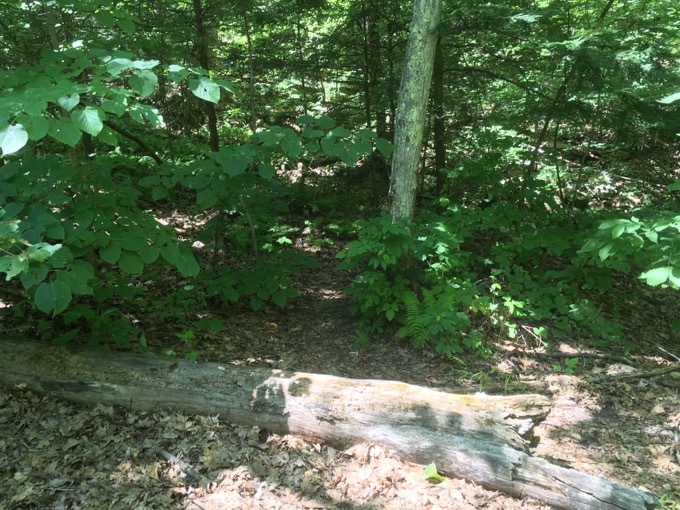 There are a number of GLT properties off of this trail but none really have trails. All of this is true. BUT… but it doesn’t give the full picture. In fairness, GLT Guy didn’t really know who I am or what I do when he responded to my email. He is selling this whole expanse short. Like, Emmanuel Lewis short. I had walked the Broad Hill Road “trail” previously with Calvin and my dad while hiking the western half of Holcomb Farm. 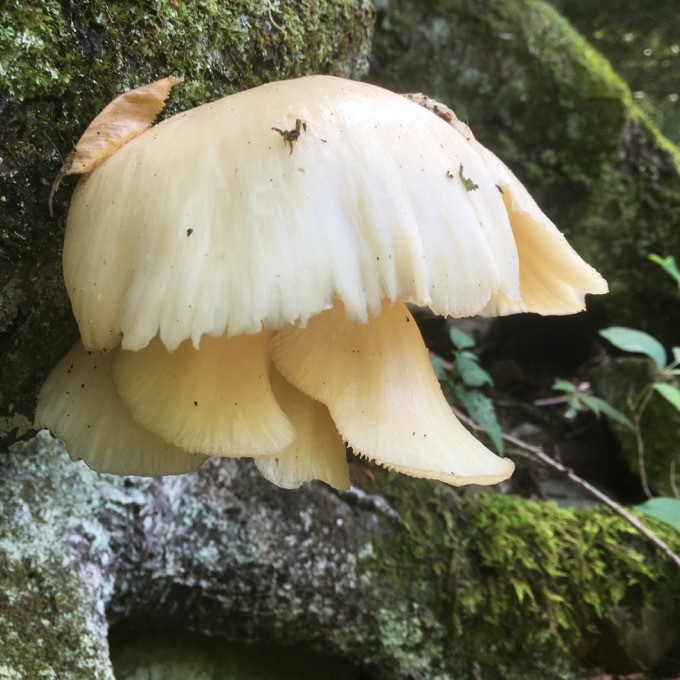 It’s a nice woods road that kindly takes you to Carpenter’s Falls and even to Enders Falls if you follow McLean’s Pine Cone Trail past its end – a couple miles west of the trail to Diamond Ledges. Turn around. There’s a faint trail into the woods. 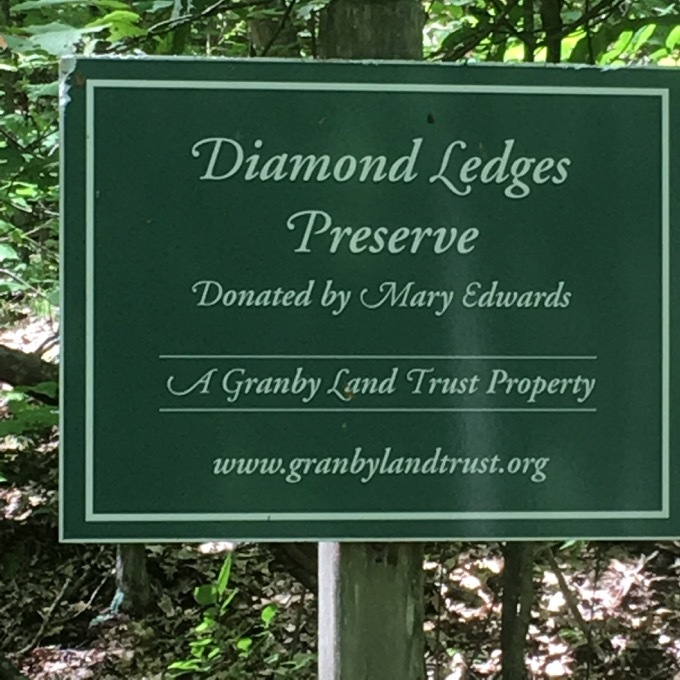 You may even see the Diamond Ledges sign. Follow. This. Trail. 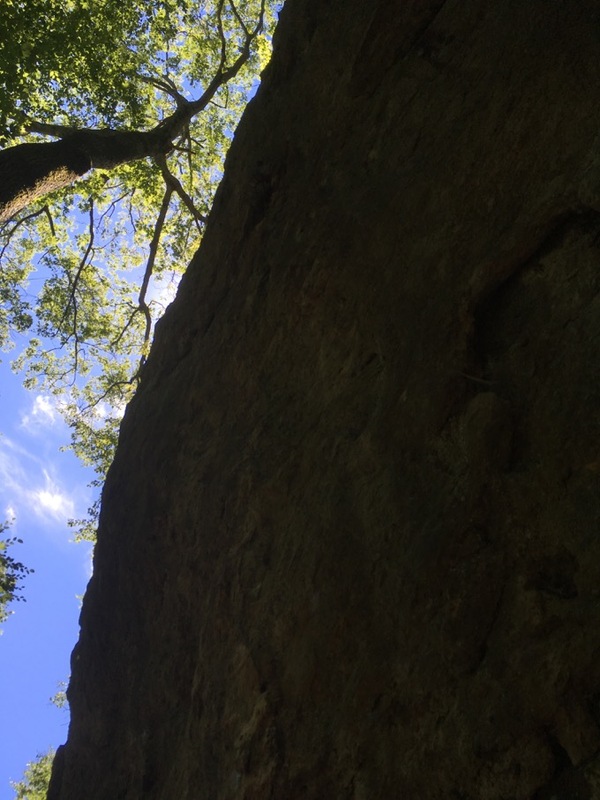 In short order, it become very rocky and then downright bouldery. Fun stuff! If you spend your time with your head down, watching your footfalls, you’re brain will melt once you look up. Holy cow! Certainly one of the most impressive cliff walls in the entire state! 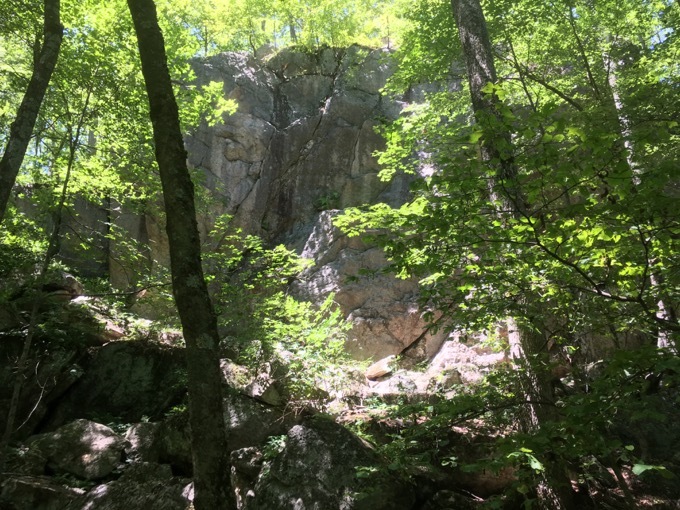 (And yes, I’ve hiked all over the northwest hills and the Metacomet Ridge, trust me.) I was stunned. 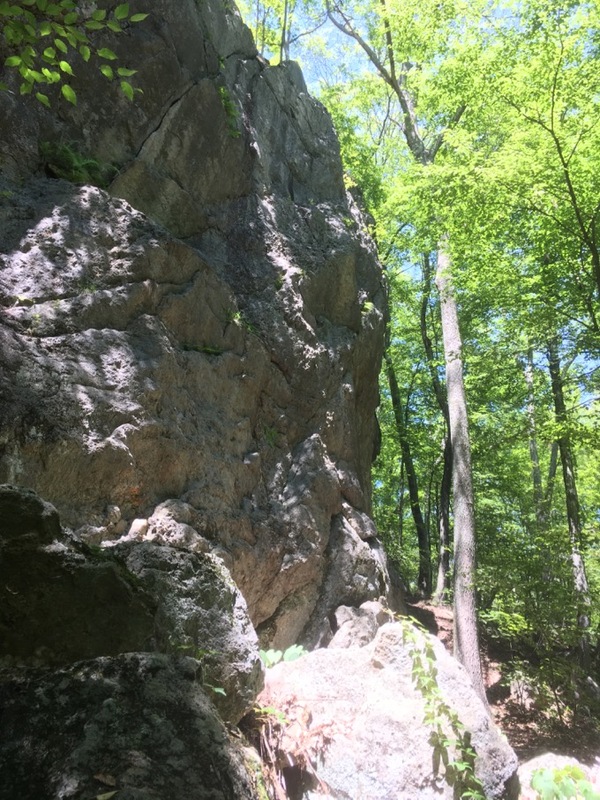 I know that rock climbers come here to test their skills, and it looks to be a challenging and fun place to do so. 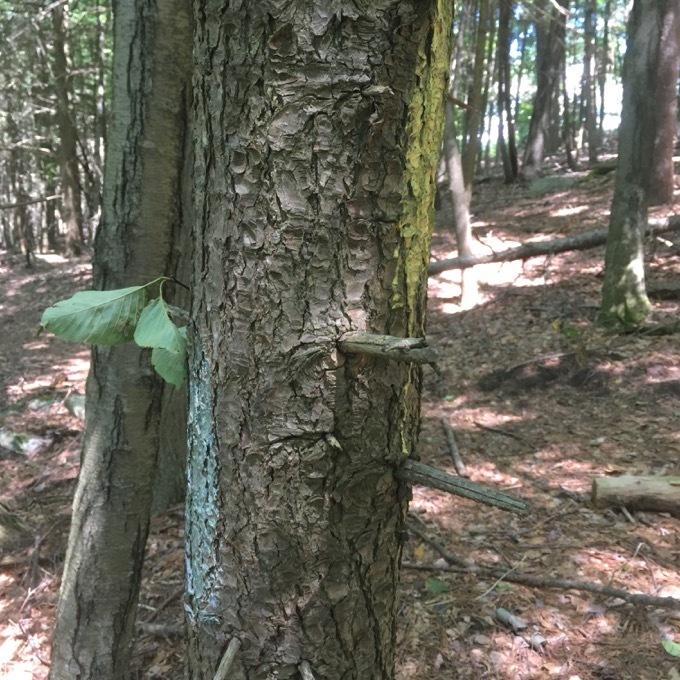 As for me, I followed a trail below its face and up and around to the back and top of it. Just to give you some perspective that my photos lack – you will die instantly if you fall off the top of this. Straight up. Dead. Granby has secrets, man. And Diamond Ledges is certainly one. 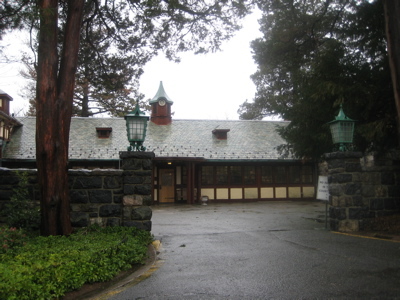 Definitely worth checking out and it’s only a few minutes’ walk from the aforementioned parking area. There are other GLT properties scattered about. But even if you stick to the biggies, they are rather excellent. 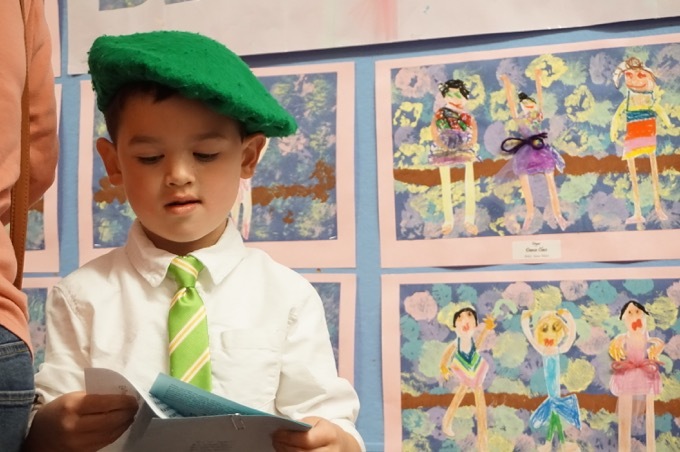 I’ve very much enjoyed getting to know the GLT and recommend you do the same. They seem to be an active organization, and even though I’ve “completed” the town, I’m guessing I’ll be back some day to hike some new GLT property.